One of the most enjoyable aspects of visiting Turkey is the food. Turks may not be the most famous in the kitchen, but that means delicious surprises await you upon your arrival. Coming to Cappadocia will give you no lack of opportunities to sample tasty Turkish treats. Begin each morning with Taşkonaklar Hotel’s renowned Turkish breakfast full of locally grown products. 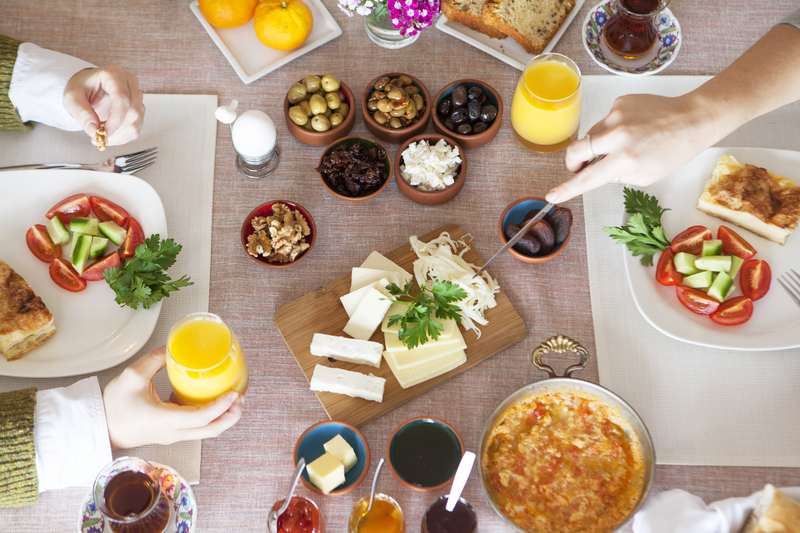 Fill your plate with olives, tomatoes, cucumbers, fresh baked breads and rolls (poaça), honey, homemade jellies/jams, and eggs (try menemen to be really Turkish, a mix of peppers, tomatoes and eggs), and Turkish tea or coffee. That should tide you over until lunch, but if you need a snack in between we recommend pistachios from Antep or locally grown and dried apricots. For lunch the choices are all mouth watering. Begin with a steaming hot bowl of lentil soup (mercimek). For the main course perhaps you will prefer the grilled meatballs (köfte) or chicken on the skewer (tavuk shish). If not, try the Adana kebap (spiced ground beef on a skewer) or the Kuzu shish (lamb on a skewer). If that sounds too heavy, then you may want the cheese or mince meat pide (pronounced pee-day) which is an elongated Turkish version of pizza without tomato sauce. Or you can try the baked beans (kuru fasulye) and rice, which are the favorite of many Turks. Each of these goes well with an Efes Beer. Once you finish take some time to sit and chat while enjoying a cup of Turkish tea and some baklava. If you need a snack before dinner while you are out and about on a tour, try some Turkish Delight and a cup of fresh squeezed pomegranate and orange juice which can be found at most tourist stops. When you sit down to the dinner table be ready for a Turkish feast. Begin with some appetizers (mezes) which could include a tomato-pepper salsa, yogurt and dill (cacik), roasted mushrooms smothered in cheese, humus, an eggplant/aubergine (patlican) salad, and fresh bread (the Turkish meze menu can go on for pages). For the main entree someone in your party needs to order the Testi Kebab, a Cappadocian specialty. Take cubed beef and put it in a seramic pot; add tomatoes, peppers, garlic, spices, and a special sauce; seal it and throw it in the tandir oven for 2 hours. The waiter will bring the sealed pot to your table and break it open in front of you. Once the steam clears enjoy. For the others in your party (or for the other evenings of your trip) order Imam Bayildi (Imam Fainted) which is Eggplant/aubergine stuffed with sauteed tomatoes, peppers, onions and garlic, or Karni Yarik which is similar to Imam Bayildi except that it also has ground beef. Both are wonderful if you enjoy eggplant. 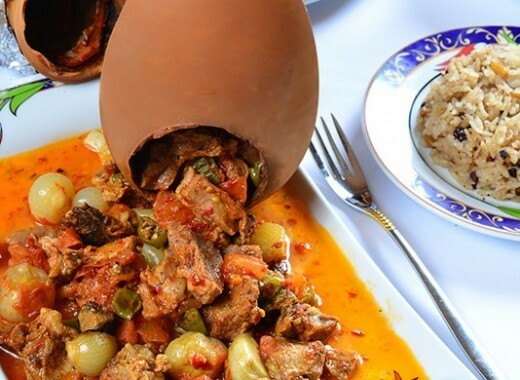 Wash this down with a Cappadocian wine of which Kocabağ and Turasan are the most well-known. You may be surprised at the level of quality Cappadocia wineries have achieved. And with that you have feasted and can be rolled back to your cave hotel room. But, honestly, this is just a sliver of Turkish cuisine. We could go on and on with recommendations, but we will not except for a few items we could not fit into our perfect day. You may be staying in Turkey for longer than 2-3 days and want to try a larger variety of dishes. In that case we can recommend a few “common” items that almost every Turk, from the lowest street cleaner to the president himself, enjoys. 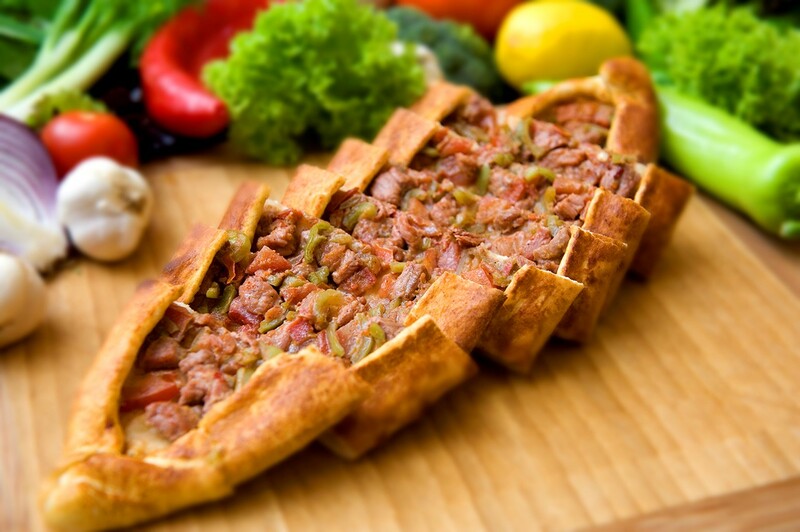 * Lahmacun is an Anatolian specialty, truly a “food of the people”. It is usually the least expensive item on the menu. It is pizza-shaped but is thinner and has no tomato sauce or cheese. * Simit looks like a type of bagel with sesame seeds. It is chewy and delicious, especially when it is fresh. You will find two kinds of simit. The street vendors sell a harder, darker type whereas the bakeries will offer a golden brown, softer version. Try them both and let us know your favorite. * Gözleme is similar to a Mexican quesadilla except that it is usually square and comes in more flavors. You can get it with cheese or spinach or potatoes or onions. The bread is called yufka and is thinner than a tortilla. * Döner comes from the Turkish word which means “to turn” and describes the way the spiced meat (usually lamb or chicken) is cooked. This is Turkish fast food at its essence and can be found on almost every street corner in urban areas. This is also called Gyro or Schwarma in other parts of the world. * DRINKS – Two drinks not mentioned are Ayran which is a salted yogurt drink that is the staple of every child in Turkey and Raki which is an anise liquor (think liquid black licorice) made famous for being Ataturk’s favorite drink. And with that you have enough to keep your palate happy and your stomach full. If you leave Turkey without gaining a few pounds, you have more self-disicipline than most. Consider it a way to take Turkey back home with you.